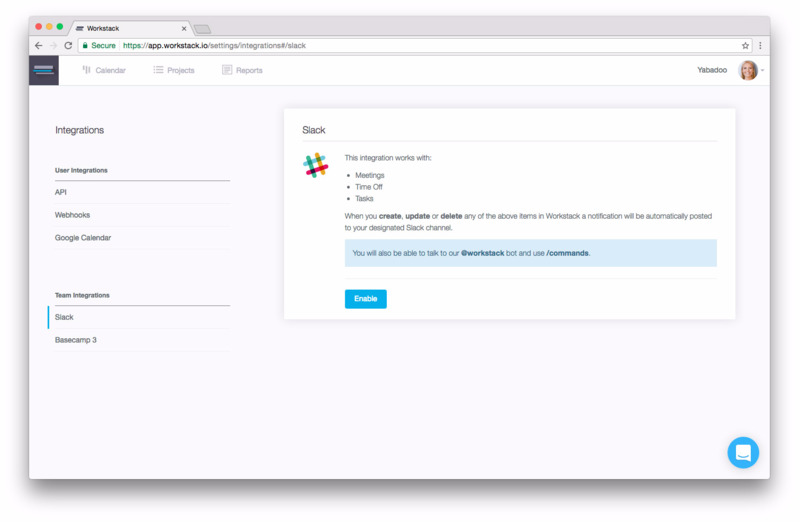 If you are using Slack you can connect your account with Workstack. However, before you do it's important to review the following checklist. Only the Owner of the Workstack account can do this. You can only only connect a single Slack channel to Workstack. Make sure you are logged into the correct Slack account that you want to connect to Workstack. Open the Slack settings by clicking Link to other apps from the admin menu at the top-right. Click Enable then select the Slack channel you want to connect to and Authorize. Remember this connection will notify your selected Slack channel with any updates to Meetings, Time Off and Tasks. The Workstack Slack bot is called @workstack - just type "@workstack" into the message window in Slack and hit return, you'll then be given an option to invite the bot to your channel. Type "Hello @workstack" - the bot will then need to link your Slack user to your Workstack user. What's next? - This will show your next tasks in the calendar. Forget me - This unlinks your Slack user from your Workstack user. Slack commands are automated routines that Slack can preform for you - like shortcuts. You can see the available Workstack commands by typing "/" and scrolling down to the bottom of the list that appears. Note: /newtodo will create a new Todo outside of any project so to view it you'll need to open the project panel on the left-side of the calendar and select No Project.